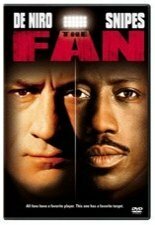 Spoiled baseball superstar Wesley Snipes signs a big contract with the San Francisco Giants and, after a terrible slump, becomes the target of obsessive fan and former knife salesman Robert De Niro's rage. John Leguizamo, Ellen Barkin and Benicio Del Toro also star in this gripping thriller from Tony Scott ("Crimson Tide"). 116 min. Standard; Soundtracks: English Dolby Digital 5.1, Dolby Digital stereo, French Dolby Digital stereo, Spanish Dolby Digital stereo; Subtitles: English, Spanish.